David Craven (right) and Michael Owen (left) in their homemade sailing dingy. 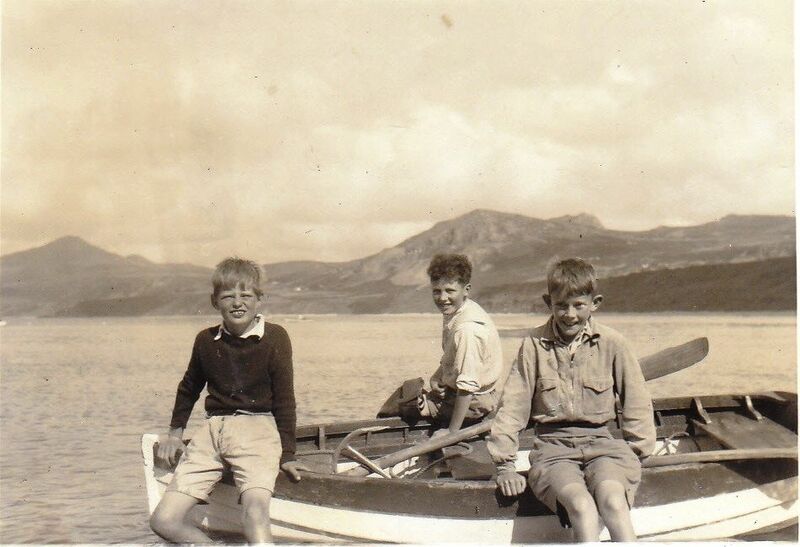 The photograph above (photo 1) highlights what may have been the earliest junior sailing-dingy event on Nefyn Beach. 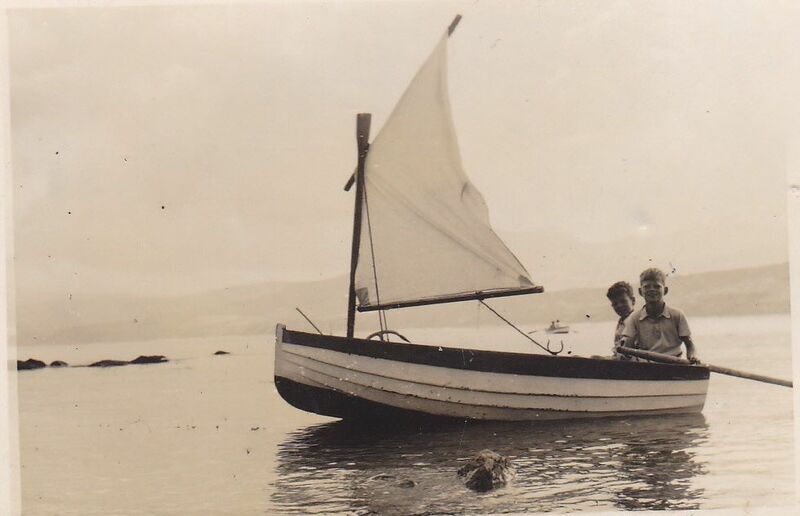 The photo shows my brother Michael Owen (left) and friend David Craven (right) in their 'home-made' sailing dingy endeavoring to catch some wind on the inside of the Creigiau Bach breakwater in front of the cottages on Nefyn Beach. The photo was taken in the late 1940's approximately twenty years before the Nefyn Sailing Club was officially established. The boys were around nine to ten years old at the time. The Cadet class sailing dingy, which later became a favorite for young sailing enthusiasts, had not yet been introduced. Pre-teen children at the time were supposed to build sandcastles not hoist spinnakers. But the little minds of the day were active and quite skillful. The Craven family, father, mother, son David and younger daughter Angela, were visitors from Buxton in Derbyshire staying at the Hafod-y-Mor cottage on the beach. Fred Craven, the patriarch of the family, was a friendly, down-to-earth individual who got along with everyone. He was certainly a favorite among the local fishermen. 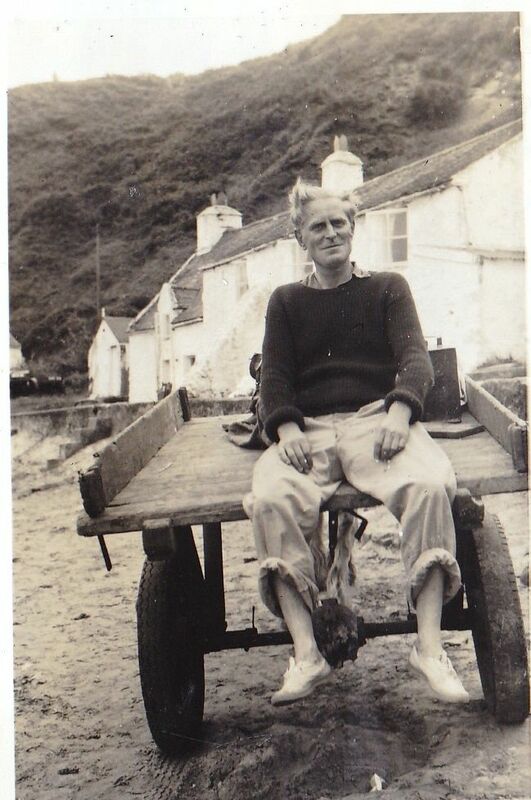 He often helped to drag their boats off the beach when a northwesterly gale was imminent and he was eager to learn their techniques for catching mackerel and for using lobster pots. The photos below (photo 2 and 3) show a mix of visitors and fishermen dragging a motor boat up a slipway off the beach and also show Fred in a jovial mood sitting on the back of a horse and cart outside the cottages. During their two week stay, the family rented a small rowing boat from my father, local fisherman Lawrence Owen. Mike, David and other friends played in the boat with Mike showing David how to scull and how to row - just a pair of Welsh and English kids having fun together. Photo #4 shows the boys sitting on the boat with David on the left and Mike in the center. The two boys concluded very quickly that sculling and rowing was hard work and not very exciting. Much more interesting was a boat with a sail where the wind did all the work. They made ambitious plans to convert the rowing boat into a fast sailing dingy! They tied one oar from the boat to the front seat as a mast and secured it in place with rigging connecting the top of the mast to the gunnel on each side of the boat. David hurried into the Hafod y Mor cottage and brought out a bed sheet to use as a sail for the dingy. They cut the sheet to size and reinforced its corners with pieces of cardboard for added strength. They used two poles from my father's shed as a boom and yardarm for the sail. They secured the boom to a rowlock hole and the second boat oar was used as a combination tiller/rudder over the stern. It was a masterful conversion and the photo is testament to the boys ingenuity. After it was completed, they both sat at the stern of the 'home-made' sailing dingy with David in charge of the tiller and Mike in charge of the boom. Then they waited patiently for the wind to take them away! Alas, things did not work out exactly as planned! The wind never materialized and they became stuck on some stones which accumulated in those days on the inside of the Creigiau Bach breakwater. To make things worse, David's mother suddenly appeared in the cottage upstairs window and loudly reprimanded David for removing the bed-sheet from the house without permission! She sounded really upset according to Mike! She must have calmed down very quickly because she came out of the cottage with a camera in hand and proceeded down the steps on to the beach to snap the iconic photograph capturing what the boys had accomplished together. Although they were somewhat disappointed that day, the boys endeavor was not entirely in vain, indeed it only further stoked their nautical and yachting interests. Mike, like my father, continued a lifelong passion for boats and he owned a 25ft motorized yacht well into his retirement, sailing out of the Menai Straits. David continued his interest in sailing and went on to buy his own high-speed racing yacht within a few of years of the event at Nefyn. He became an avid and accomplished sailor. Like his father, he was also a jovial individual, always fooling around and eager to make friends with everyone. He was one of a few visitors I knew at the time who made a conscientious effort to learn some Welsh. Unfortunately he got his newly learned Welsh phrases a little mixed up and used the wrong phrase with the wrong company at the wrong time, much to the chagrin of his local friends. David was a good guy. He participated in many sailboat races in Nefyn Bay in the 1950's and 1960's and was an enthusiastic supporter of the Sailing Club when it was formed in the late 1960's. I believe the Craven Cup, on the clubs current racing card portfolio, was established in recognition of the Craven's family contributions to the early days of sailing on the beach and in particular to David Craven's supportive and energetic participation. 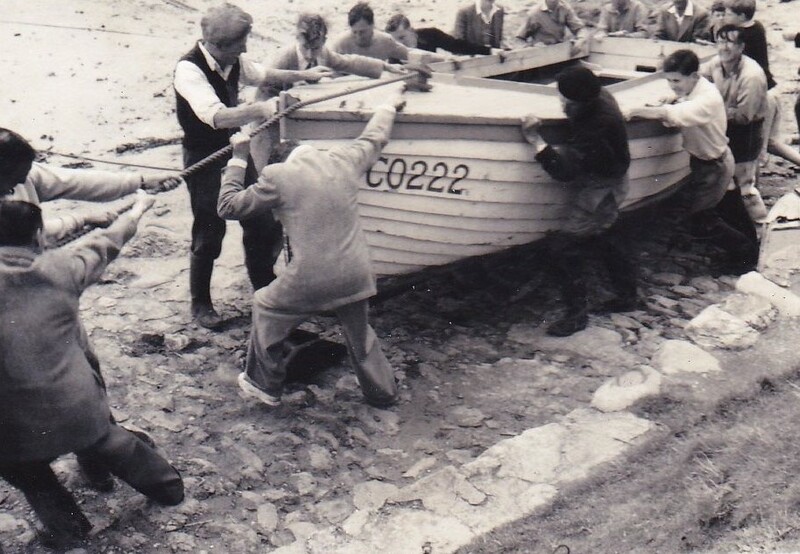 English visitors and local fishermen dragging a motorboat up a slipway on Nefyn beach. Fred Craven sitting on the back of a horse and cart by the cottages. David Craven (left), Michael Owen (center) and friend sitting on the rowing boat.